Alere commissioned us to design a set of medical posters to demonstrate alternative healthcare pathways achievable through the use of their innovative point-of-care diagnostic products. The design of the medical posters took the form of two flow diagrams, one following the traditional care pathway, and one showing the Alere pathway. 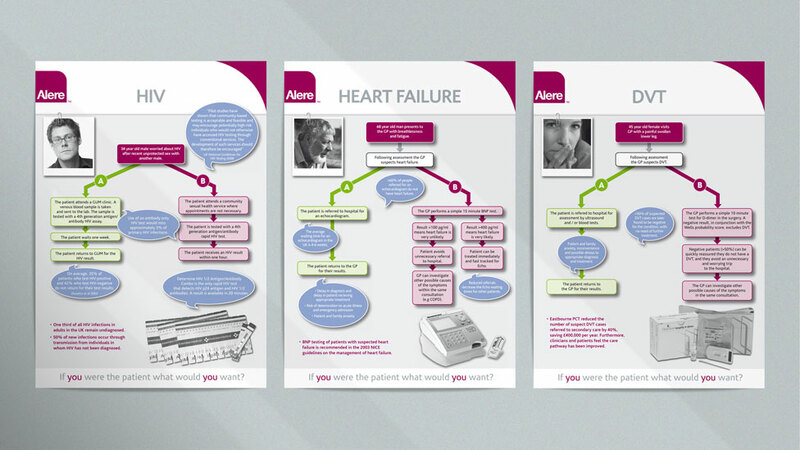 This graphical approach showed very quickly and visually the benefit to patients delivered through Alere’s products. We designed a total of eight medical posters within the set, each one focusing on a specific therapy area and promoting the relevant Alere product. The posters were given a personal touch with the inclusion of a polaroid style photo of a patient, reinforcing the message that the choice of heathcare pathways is about real people and therefore the patient should always be at the centre of any decision. Click here for other examples of effective healthcare communications.